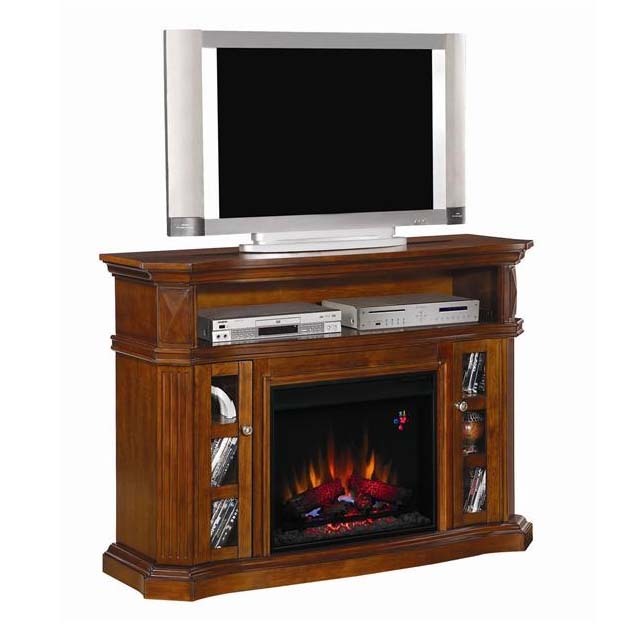 More on the Classic Flame Bellemeade Entertainment Center with Electric Fireplace Insert (Walnut) 23MM774-W502 below. This multi-function transitional style media cabinet is the perfect spot for your flat screen television. The unit's integrated wire management and convenient compartments for media components were designed for the contemporary living room, while still maintaining the traditional look of a 23" Classic Flame Electric Fireplace Insert. The mantel's fluted details on the shelves and exterior complement the windowed doors, which open as one piece creating maximum side shelf storage and access. 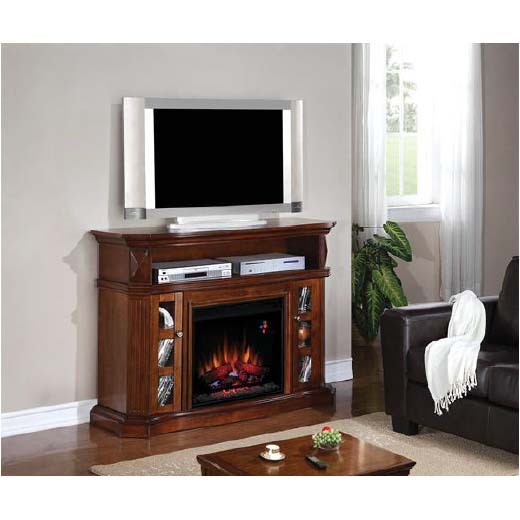 Create instant ambiance in any room of the house with Classic Flame's 23MM774-E451 "Bellemeade" multi-function media cabinet with decorative electric fireplace. Transitional style media mantel with a serpentine shape. Solid hardwood and hardwood veneer construction in a Burnished Walnut finish. Includes the 23" electric fireplace insert (23EF023GRA) - see detailed information below. 1 open, full-length AV shelf for cable boxes, satellite receivers and center channel speakers. 2 raised panel door multimedia side cabinets with inset glass doors and adjustable internal shelves. Decorative moldings and fluted details. Doors open as one piece creating extra side shelf storage & access. Easy installation -- just plug it in to any standard household outlet and enjoy! Classic Flame provides a 1-year Limited Manufacturer's Warranty. *Also available in Espresso finish. See related products below.